I was disappointed when I saw this book would be from Kelly's and Jamie's POVs instead of Seiran's because I like to stick with the same POV throughout a series, but, once I started reading, I sunk right into the new POVs easily and forgot that I had even been concerned about it in the first place. Both their POVs were just as well-written as Seiran's, and each character had a unique voice. Also, sometimes suddenly switching POVs after numerous books that were previously told entirely from one first person perspective can make either the new POV characters or the old ones feel off, but both felt natural here. It also turned out that I liked each of their POVs and the chance to get to know the characters better. For example, I hadn't known that Jamie had an eating disorder (body dysmorphic disorder and previously bulimia but handling that better now) or that Kelly had asthma. And those two things were just more to love about the book---disability rep and more mental illness rep. Eating disorders are so often only associated with women, which is a harmful stereotype because then men with eating disorders don't get the help they need, so it was nice to see the topic being tackled with a male character. It's also just nice that these books show how lots of people have their struggles and that it's ok to need help. And just like with Seiran's mental illnesses, the author seemed to do a great job showing his disorder through his actions and how it skewed his thoughts. Also just like the previous books, even though there were struggles, there was tons of love and care and support and understanding. I feel like the plot in this book was a little weak though. All the books are more character-focused than plot-focused and thus a little slow-paced for a while until things suddenly start to pick up near the end when the mysterious bad guy shows up, but I can deal with that. The problem with this one was characters making some decisions that didn't really make sense (e.g. running off to take on the bad guy all by themselves, knowing they were no match and would probably get killed) and a somewhat frustrating romance. I don't really mind when characters don't communicate because have you seen how some people act in real life? But in this case, Jamie could've at least explained why he was rejecting Kelly, explained that he was only flirting with Cat to get information, etc. And it got kind of angsty in a way that seemed like the angst was mostly included for the sake of plot and keeping the characters apart. I know Jamie had some mental struggles, but I still didn't understand his constant lash-outs at Kelly. But overall this was another sweet, enjoyable book that I flew through in about a day. It may have been a little iffy on the plot and romance, but it still kept me reading, it still had great disability and mental illness rep, and you won't find a more loving, understanding, supportive group of characters, which makes it a great read when you need something to make you say awww and smile. Fans of Books 1 and 2 in Lissa Kasey's Dominion Series. Fans of character-focused m/m urban fantasy with witches and vampires. Anyone who likes books with struggles and/or mental illness but also lots of positivity and support, plus a bit of fluffiness, to balance it out. Was worried I wouldn't like a book with different POV characters, but this was just as good as the others in the series! And I'm loving all the disability rep (this time it was asthma and eating disorders). Full review soon. 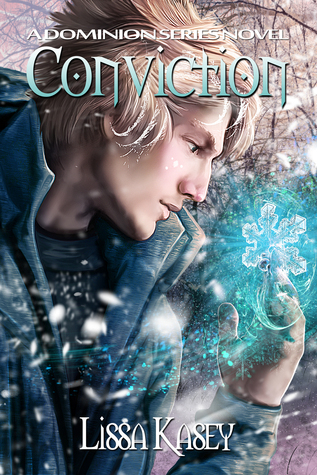 Sign into Goodreads to see if any of your friends have read Conviction.